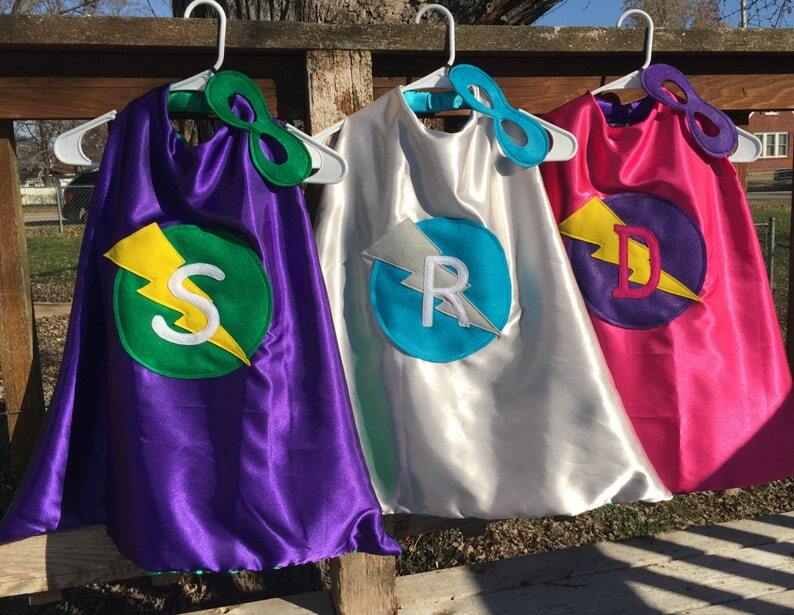 Personalized Superhero Capes! 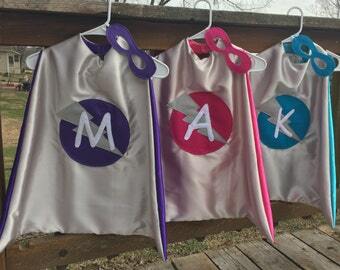 Choose any 2 colors for your Custom Reversible Kid's Cape. 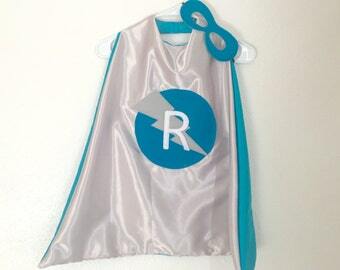 Each cape is double-sided and custom made from 100% machine washable polysatin. 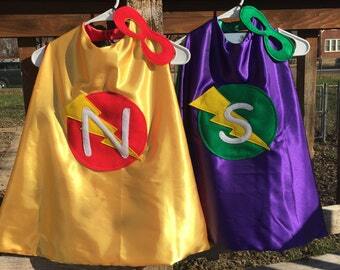 The exterior of the cape features a lightening bolt logo with your little hero's initial, the interior of the cape is blank in the color of your choice. Velcro attaches/detaches cape at neckline. Felt mask features two coordinating colors from the cape colors/logo you choose, with elastic sewn securely into mask. All logos and masks are cut by hand, and made from earth friendly Eco-fi felt, which is made from recycled soda bottles. Logos are sewn onto the cape securely. ***Please Note: Yellow Lightening Bolts will always be included behind the letter, UNLESS you specify in the Notes something different, such as "pink lightening bolt" or "NO lightening bolt, just a letter on a circle." etc. Black, Red, Royal Blue, Hot Pink, Purple, Light Gold, Green, Orange, Silver, Turquoise. Royal Blue, Turquoise, Black, Silver, Red, Hot Pink, Purple, Green, Yellow, Gold, White, Orange. For custom designs please convo me and describe the cape you'd like! 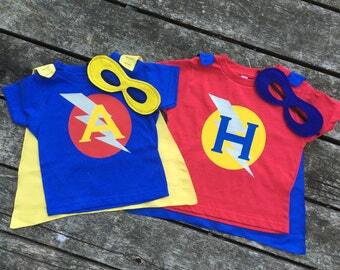 These are perfect for make-believe, pretend play, Birthdays, Christmas or Halloween! This is the 3rd cape I ordered and once again I could not have been happier with my purchase! The fabric is gorgeous and holds up well and it is beautifully sewn together. All 3 of my children love their capes. Two of the capes I purchased 4 years ago and they are still in great shape. I highly recommend this shop! My daughter is obsessed! She can’t wait to be a superhero for Halloween! These capes are top notch! My kids LOVE them!! They arrived quickly and packaged nicely. They fit perfectly along with the matching masks. This shirt was a big hit at the babyshower I was hosting. The ONLY reason why I didn’t give it 5 Stars is because the shirt ran slightly smaller than expected. Other than that, it’s great and I will order from them again!